Minister in the Prime Minister’s Department Datuk Amirsham A. Aziz – a newbie in the administration – was caught with his pants down when he was spotted reading the answer to a supplementary question in Parliament today. Ironically, the topic was the New Economic Policy (NEP) – already a controversial subject – and the first supplementary question was posed by Khairy Jamaluddin (BN-Rembau). Amirsham was meat to the prey when the Pakatan Rakyat (PR) parliamentarians pounced – all with a wide grin on their face – on his antics of bowing his head to read from his prepared text. Lim Kit Siang (DAP-Ipoh Timur) was the first to let all hell loose in the House, saying the supplementary question was already prepared. “It was a planted question. The answer is all ready,” charged Chong Eng (DAP-Bukit Mertajam). Gobind Singh Deo (DAP-Puchong) also rose to add to the ruckus by accusing Amirsham of having his answers ready. “Siap jawapan sampai dua muka! (Prepared answers run to to pages! )”said Mahfuz Omar (PAS-Pokok Sena). Deputy Speaker Ronald Kiandee tried to calmly take charge of the ruckus by saying: “Cukup lah Yang Berhormat (enough Yang Berhormat), Yang Berhormat sila duduk (Yang Berhormat, please sit down). Sila duduk Yang Berhormat (Sit down Yang Berhormat),”. However, he seemed to have had little control over the situation as the shouting continued while Amirsham went on reading his answer. Khairy asked if he (Amirsham) thought Penang Chief Minister Lim Guan Eng (DAP-Bagan)’s vow to abolish the use of NEP in the state administration is because “it breeds corruption, cronyism and systemic inefficiency”. “If that is his conclusion, then anyone who got assistance from it whether in loans, job opportunities, scholarships, entrepreneurship opportunities and others are cronies and corruptors,” he said, going on to provide figures while the ruckus continued. Ramasamy asked whether the NEP had lost its original principle of affirmative action which is widely known throughout the world to be giving to the minority instead of the majority. “Affirmative action is to help the people who are left behind like the poor and the lower income community. That is the NEP’s aim and its policies are to help overcome and reduce poverty as well as to give equal opportunities to all Malaysians,” Amirsham replied. Amirsham said the government did not plan to change the policies evolving from the basic spirit of the NEP, the National Development Policy, the National Vision Policy and the National Vision under the 9th Malaysia Plan. Kiandee then called for Mohamed Azmin Ali (PKR-Gombak) to take the floor to raise his question. But just before Mohamed Azmin took the floor, Datuk Seri Panglima Abdul Ghapur Salleh (BN-Kalabakan) called for a Point-of-Order in Standing Order 44, asking the Speaker to take control of the situation. “This is like a market, Speaker! People watch us on television! 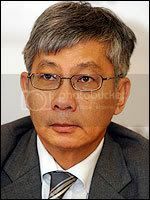 Can we ask for control?” he said to which Kiandee assured that it was under control and Lim stood up to call for no “extreme control to the point that the minister has answers (to the supplementary question)”. Khairy did not take it sitting down, calling for Point of Order on Rule 36 (character assassination) and asked for Mohamed Azmin to retract his statement. The peace in the House ws restored when Kiandee asked Mohamed Azmin to proceed with his question.